This plugin allows end users to create and edit static pages and menus with a simple WYSIWYG user interface. Static pages are managed on the Pages tab of the Static Pages plugin. Static pages have three required parameters - Title, URL and Layout. The URL is generated automatically when the Title is entered, but it could be changed manually. URLs must start with the forward slash character. 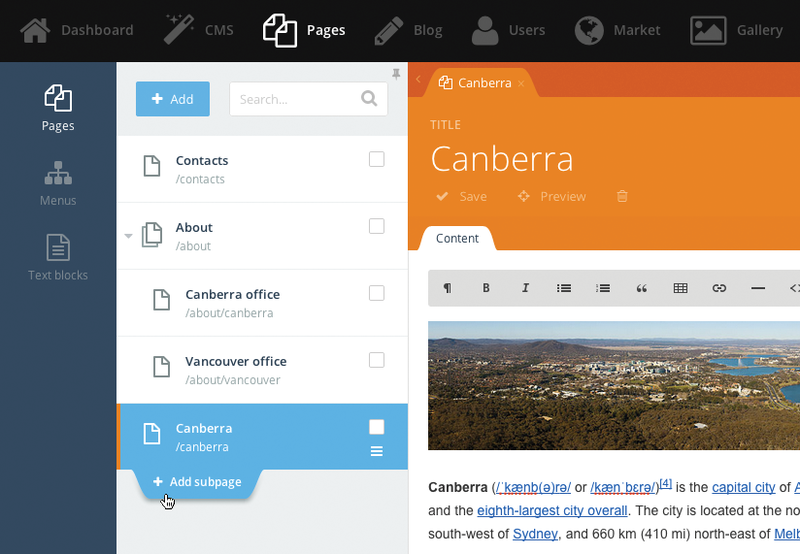 The Layout drop-down allows to select a layout created with the CMS. Only layouts that host the staticPage component are displayed in the drop-down. Pages are hierarchical. The page hierarchy is used when a new page URL is generated, but as URLs can be changed manually, the hierarchy doesn't really affect the routing process. The only place where the page hierarchy matters is the generated Menus. The generated menus reflect the page hierarchy. You can manage the page hierarchy by dragging pages in the page tree. The page drag handle appears when you move the mouse cursor over page item in the tree. Optional properties of static pages are Hidden and Hide in navigation. The Hidden checkbox allows to hide a page from the front-end. Hidden pages are still visible for administrators who are logged into the back-end. The Hide in navigation checkbox allows to hide a page from generated menus and breadcrumbs. If a static layout contains placeholders, the static page editor will show tabs for editing the placeholder contents. The plugin automatically detects text and HTML placeholders and displays a corresponding editor for them - the WYSIWYG editor for HTML placeholders and a text editor for text placeholders. You can manage menus on the Menus tab of the Static Pages plugin. A website can contain multiple menus, for example the main menu, footer menu, sidebar menu, etc. A theme developer can place menus to a page layout with the staticMenu component. Menus have two required parameters - the menu Name and menu Code. The menu name is displayed in the menu list in the back-end. The menu code is required for referring menus in the layout code, it's the API parameter. Menus can contain multiple menu items, and menu items can be nested. Each menu item has a number of properties. There are properties common for all menu item types, and some properties depend on the item type. The common menu item properties are Title and Type. The Title defines the menu item text. The Type is a drop-down list which displays all menu item types available in your OctoberCMS copy. The available menu item types depend on the installed plugins, but there are three basic item types that are supported out of the box. Items of this type are links to a specific fixed URL. That could be an URL of an or internal page. Items of this type don't have any other properties - just the title and URL. Items of this type refer to static pages. The static page should be selected in the Reference drop-down list described below. Items of this type expand to create links to all static pages defined in the theme. Nested pages are represented with nested menu items. An item of this type represents a link to a specific blog category. The category should be selected in the Reference drop-down. This menu type also requires selecting a CMS page that outputs a blog category. An item of this time expands into multiple items representing all blog existing categories. This menu type also requires selecting a CMS page. Depending on the selected menu item time you might need to provide other properties of the menu item. The available properties are described below. A drop-down list of objects the menu item should refer to. The list content depends on the menu item type. For the Static page item type the list displays all static pages defined in the system. For the Blog category item type the list displays a list of blog categories. This checkbox is available only for menu item types that suppose nested objects. For example, static pages are hierarchical, and this property is available for the Static page item type. On the other hand, blog categories are not hierarchical, and the checkbox is hidden. A checkbox determining whether the menu item should be replaced with generated menu items. This property is available only for menu item types that suppose automatic item generating, for example for the Static page menu item type. The Blog category menu item type doesn't have this property because blog categories cannot be nested and menu items of this type always point to a specific blog category. This property is very handy when you want to include generated menu items to the root of the menu. For example, you can create the All blog categories menu item and enable the replacing. As a result you will get a menu that lists all blog categories on the first level of the menu. If you didn't enable the replacing, there would be a root menu item, with blog categories listed under it. This drop-down is available for menu item types that require a special CMS page to refer to. For example, the Blog category menu item type requires a CMS page that hosts the blogPosts component. The CMS Page drop-down for this item type will only display pages that include this component. The Code field allows to assign the API code that you can use to set the active menu item explicitly in the page's onInit() handler described in the documentation. Google Maps snippet - outputs a map centered on specific coordinates with predefined zoom factor. That snippet would be great for static pages that explain directions. Universal commenting system - allows visitors to post comments to any static page. Third-party integrations - for example with Yelp or TripAdvisor for displaying extra information on a static page. Snippets are displayed in the sidebar list on the Static Pages and can be added into a rich editor with a mouse click. Snippets are configurable and have properties that users can manage with the Inspector. Read the Getting started with Static Pages tutorial in the Blog. # 101 in Free of all time. Create SaaS application: manage users, clusters (groups) and their plans. # 188 in Free of all time. # 163 in Free of all time. # 122 in Free of all time. # 437 in Free of all time. # 479 in Free of all time. The plugin currently includes three components: Static Page, Static Menu and Static Breadcrumbs. title - specifies the static page title. content - the static page content. Add the staticMenu component to the static page layout to output a menu. The static menu component has the code property that should refer a code of a static menu the component should display. In the Inspector the code field is displayed as Menu. title - specifies the menu item title. url - specifies the absolute menu item URL. isActive - indicates whether the item corresponds to a page currently being viewed. isChildActive - indicates whether the item contains an active subitem. The component injects the breadcrumbs page variable that contains an array of the MenuItemReference objects described above. In some cases you might want to mark a specific menu item as active explicitly. You can do that in the page's onInit() function with assigning the activeMenuItem page variable a value matching the menu item code you want to make active. Menu item codes are managed in the Edit Menu Item popup. When a static page is first created it will be assigned a file name based on the URL. For example, a page with the URL /chairs will create a content file called static-pages/chairs.htm in the theme. This file will not change even if the URL is changed at a later time. There is no ordering information for this product. 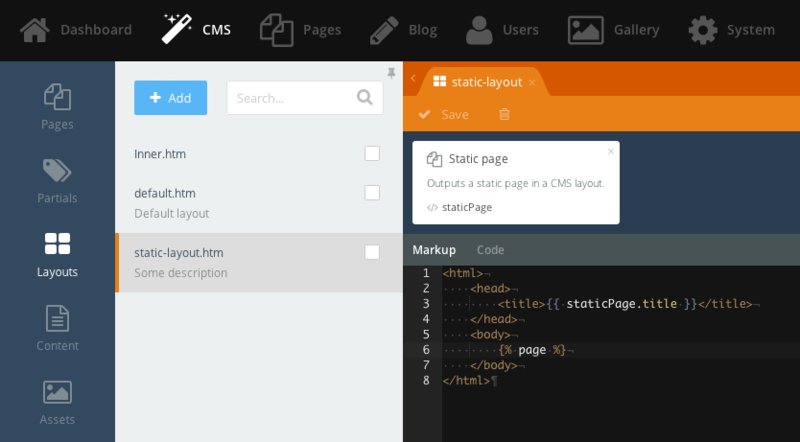 Plugins can extend the Static Pages plugin with new menu item types. Please refer to the Blog plugin for the integration example. New item types are registered with the API events triggered by the Static Pages plugin. The event handlers should be defined in the boot() method of the plugin registration file. There are three events that should be handled in the plugin. pages.menuitem.listType event handler should return a list of new menu item types supported by the plugin. pages.menuitem.getTypeInfo event handler returns detailed information about a menu item type. pages.menuitem.resolveItem event handler "resolves" a menu item information and returns the actual item URL, title, an indicator whether the item is currently active, and subitems, if any. The next example shows an event handler registration code for the Blog plugin. The Blog plugin registers two item types. As you can see, the Blog plugin uses the Category class to handle the events. That's a recommended approach. All elements of the array are optional and depend on the menu item type. The default values for dynamicItems and nesting are false and these keys can be omitted. The dynamicItems element is a Boolean value indicating whether the item type could generate new menu items. Optional, false if omitted. Examples of menu item types that generate new menu items: All blog categories, Static page. Examples of item types that don't generate new menu items: URL, Blog category. The nesting element is a Boolean value indicating whether the item type supports nested items. Optional, false if omitted. Examples of item types that support nesting: Static page, All static pages. Examples of item types that don't support nesting: Blog category, URL. The reference keys should reflect the object identifier they represent. For blog categories keys match the category identifiers. A plugin should be able to load an object by its key in the pages.menuitem.resolveItem event handler. The references element is optional, it is required only if a menu item type supports the Reference drop-down, or, in other words, if the user should be able to select an object the menu item refers to. The cmsPages is a list of CMS pages that can display objects supported by the menu item type. For example, for the Blog category item type the page list contains pages that host the blogPosts component. That component can display a blog category contents. The cmsPages element should be an array of the Cms\Classes\Page objects. The next code snippet shows how to return a list of pages hosting a specific component. $type - the item type name. Plugins must only handle item types they provide and ignore other types. $item - the menu item object (RainLab\Pages\Classes\MenuItem). The menu item object represents the menu item configuration provided by the user. The object has the following properties: title, type, reference, cmsPage, nesting. $url - specifies the current absolute URL, in lower case. Always use the URL::to() helper to generate menu item links and compare them with the current URL. $theme - the current theme object (Cms\Classes\Theme). The url and isActive elements are required for menu items that point to a specific page, but it's not always the case. For example, the All blog categories menu item type doesn't have a specific page to point to. It generates multiple menu items. In this case the items should be listed in the items element. The items element should only be provided if the menu item's nesting property is true. As the resolving process occurs every time when the front-end page is rendered, it's a good idea to cache all the information required for resolving menu items, if that's possible. If your item type requires a CMS page to resolve item URLs, you might need to return the selected page's URL, and sometimes pass parameters to the page through the URL. The next code example shows how to load a blog category CMS page referred by a menu item and how to generate an URL to this page. The blog category page has the blogPosts component that can load the requested category slug from the URL. We assume that the URL parameter is called 'slug', although it can be edited manually. We skip the part that loads the real parameter name for the simplicity. Please refer to the Blog plugin for the reference. To determine whether an item is active just compare it with the $url argument of the event handler. Snippets can be created from partials or programmatically in plugins. Conceptually snippets are similar to CMS components (and technically, components can act as snippets). Partial-based snippets provide simpler functionality and usually are just containers for HTML markup (or markup generated with Twig in a snippet). To create snippet from a partial just enter the snippet code and snippet name in the partial form. Property title - specifies the property title. The property title will be visible to the end user in the snippet inspector popup window. Property code - specifies the property code. The property code is used for accessing the property values in the partial markup. See the example below. The property code should start with a Latin letter and can contain Latin letters and digits. Type - the property type. Available types are String, Dropdown and Checkbox. Default - the default property value. For Checkbox properties use 0 and 1 values. Options - the option list for the drop-down properties. The option list should have the following format: key:Value | key2:Value. The keys represent the internal option value, and values represent the string that users see in the drop-down list. The pipe character separates individual options. Example: us:US | ca:Canada. The key is optional, if it's omitted (US | Canada), the internal option value will be zero-based integer (0, 1, ...). It's recommended to always use explicit option keys. The keys can contain only Latin letters, digits and characters - and _. In addition, properties can be passed to the partial components using an external property value. A same component can be registered with registerPageSnippets() and registerComponents() and used in CMS pages and Static Pages. For more details on syntax fields, see the Parser section of the October documentation. Note: The repeater field type is currently unsupported, however we hope to change this in the future. Just like CMS objects have the view bag component to store arbitrary values, you may use the viewBag property of the MenuItem class to store custom data values and add corresponding form fields. The Static Pages plugin is exactly what I was looking for. It provides an easy way to create menus and pages without exposing code to the creator/editor. Very nice. Thanks for this plugin! Tell me please how can i add a translatable field to page? I love this plugin but I have one issue, the kind of setup we have, we do not store anything on the server, only application files. Is there a way we can store page content into the database? This make sure we are not tied to one machine. And I believe this is the type of CMS pages people are used to. By the way, October has given us CMS in files which is awesome, I don't think this plugin should do the same, its like repetition of concept. The plugin is very useful. At the beginning of my work with October I have built pages without using Static Pages. Now I cannot imagine website without it. Nice plugin, but it becomes very slow with 100+ pages. Also it seems odd to store all pages in the theme folder. Storing data in a database would be a better decision. How can I use this function with this plugin ? I need to pass a variable from layout in static pages. thanks for this cool plugin. bat i have this layout: Layouts not found in dropdowmeun. i have layout page in cms. bat not show in pages settings. thank you. Just getting started with October coming from straight Laravel and Static Pages made my deadline'd day. I really like it. Lack of translate plugin synergy is something I would like to see in next a update. Very great plugin! Is the an option to create functional mega menu with three levels? Very useful for letting clients edit their pages without having to touch any code. Nice work! Really a great plugin ! How can i make a snippet from a component? Components as snippets great Job!! Snippets it is very useful functional!! Thanks! Hey there, Awesome plugin! One thing though - is there no way to make it possible to include partials inside static pages? That would be incredibly useful. Thanks. I LOVE how menu's and static pages and menu's don't use the database at all. Version control is now happy. StaticMenu component now exposes menuName property; added pages.menu.referencesGenerated event. Catch exception with corrupted menu file. Fixes cache-invalidation issues when RainLab.Translate is not installed. Added Greek & Simplified Chinese translations. Removed deprecated calls. Allowed saving HTML in snippet properties. Added support for the MediaFinder in menu items. Fixes a bug when saving a template that has been modified outside of the CMS (mtime mismatch). Back-end navigation sort order updated. Add theme logging support for changes made to menus. Fixes bug when AJAX is used on a page that does not yet exist. Fixes minor issue when using snippets and switching the application locale. Implements repeater usage with translate plugin. Streamline generation of URLs to use the new Cms::url helper. Add conditional support for translating page URLs. Fixes a bug where creating a content block without extension doesn't save the contents to file. Fixes issue with duplicating properties when adding multiple snippets on the same page. Shared view variables are now passed to static pages. Fixes a bug where the parent page is lost upon changing a page layout. Fixes a bug where the cursor is misplaced when editing text files. Snippets can now be moved by dragging them. Use nice titles when listing the content files. Added support for translations, UI updates. Add support for repeater syntax field. Fixes a bug where selecting a layout causes permanent unsaved changes. Minor update to snippet inspector internal API. Improved the output of snippet partials when saved. Improved menu item form to include css class, open in a new window and hidden flag. Minor styling fix to the back-end UI. Fixes bug when using syntax fields. Minor fix to the StaticPage component API. Static Breadcrumbs component now respects the hide from navigation setting. Add support for Syntax Fields. Adds meta title and description to pages. Adds |staticPage filter. Fixes issue where placeholders tabs were missing from Page form. Add translations for various locales. Fixes issue where Snippet tab is missing from the Partials form. Minor improvements to the code. Minor updates to the internal API. Added support for the Sitemap plugin. Implemented the content block management and placeholder support. Fixed the page preview URL. Implemented the static pages management and the Static Page component.